Listen to more samples from Motas-6 on the samples page. Motas-6 has a super-flexible modulation architecture: each and every rotary knob parameter has independent modulation settings from key, velocity, 4 modulation sources (from MIDI and CV/gate inputs) as well as from its own EG (Envelope Generator) and LFO (Low Frequency Oscillator) - a total of 33 independent EGs and LFOs! There are also 4 global EGs and 4 global LFOs with individual amount settings for each parameter. Motas-6 has very powerful filtering capabilities. There is a 6-pole voltage-controlled low-pass filter (VCF) with adjustable resonance to self-oscillation (with selectable 1, 2, 3, 4, 5 and 6-pole outputs), a 2-pole high-pass voltage-controlled filter and a second 4-pole resonant low-pass VCF (similar in design to that of a certain silver box from the '80s). The inputs and outputs of the filters can be connected together in various ways to give a huge range of filtering possibilities. The oscillators are real analogue VCOs (not DCOs or NCOs). The oscillators, analogue noise source with pink/white output options and an external audio input feed into the pre-filter mixer which can be over-driven. There is a mixer 'boost' option for max. over-drive. Motas-6 is housed in a strong stainless steel and aluminium chassis with solid oak wooden end-cheeks. The top-panel finish options are plain stainless steel (with anti-smudge coating) or white painted. Motas-6 is powered from a high-quality 12V/1A multi-region adaptor (supplied). Under the hood, besides the many components for the analogue circuitry, there is a powerful Arm Cortex-M4 processor running at 168MHz - this controls the analogue circuits, drives the UI and generates the LFOs and EGs. 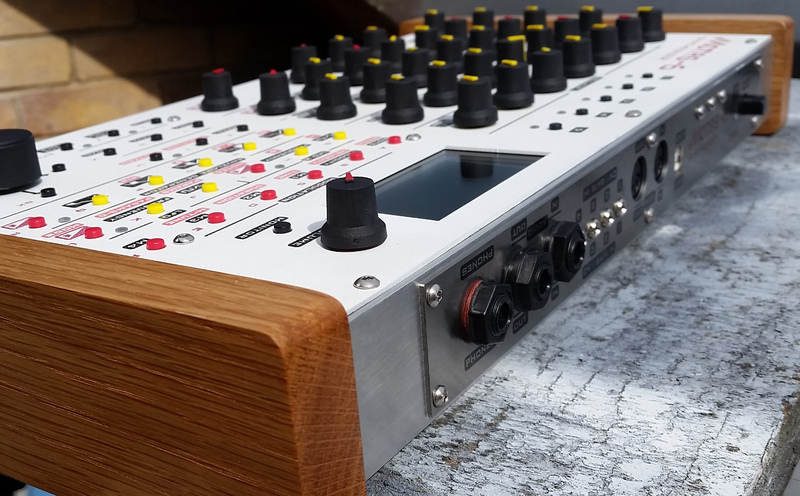 External connections on Motas-6 are: headphones out, main audio out (mono), audio input (mono), 4 CV/gate inputs (freely configurable with settings stored in non-volatile memory), traditional MIDI IN and MIDI OUT and USB MIDI (class compliant device so no extra drivers needed). Motas-6 has three voltage-controlled oscillators (VCOs). The oscillators are analogue VCOs (not DCOs or NCOs). Each oscillator has independent tracking options (when multiple notes are played): last note on, 1st note, 2nd note, 3rd note, highest, middle or lowest. This gives very flexible paraphonic playing capability. The pitch of each oscillator depends on its individual pitch settings in combination with the master pitch parameter control. 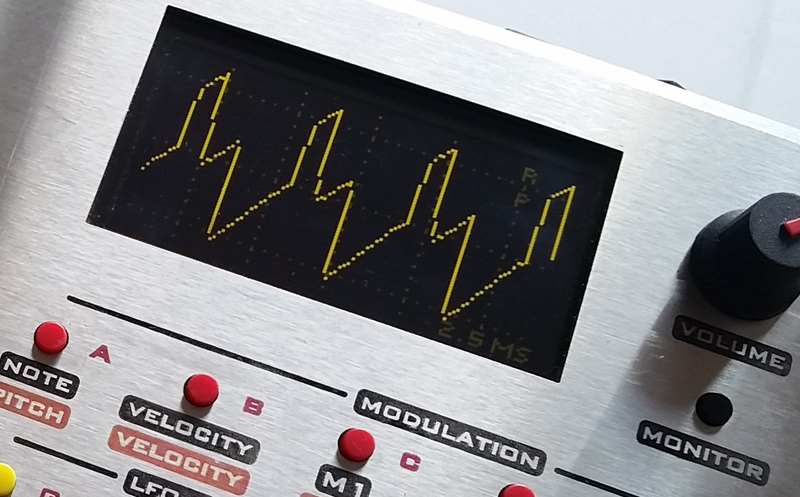 Oscillator 1 has separate triangle, sawtooth and pulse waveform outputs. The pulse-width can be controlled (PWM). Oscillator 1 can be hard-synced to Oscillator 2 and/or Oscillator 3. 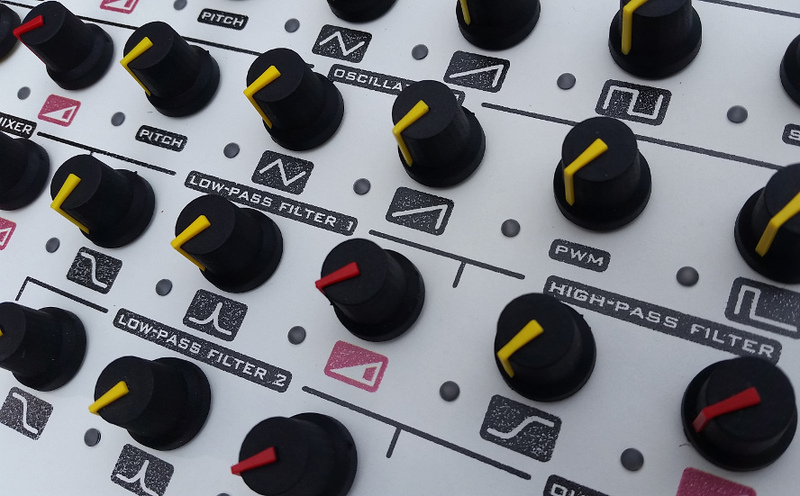 Oscillator 2 has separate triangle, sawtooth, square and sub-square waveform outputs. Oscillator 2 can be hard-synced to Oscillator 1 and/or Oscillator 3. The triangle and sawtooth waveforms of this oscillator can be phase-modulated by the triangle wave from Oscillator 1. Oscillator 3 has separate triangle, sawtooth and pulse waveform outputs. The pulse-width can be controlled (PWM). The triangle and sawtooth waveforms of this oscillator can be phase-modulated by the triangle wave from Oscillator 1 or 2. The mixer takes the signals from the 3 oscillators, noise source and external input and outputs to the filters. The mixer output will distort (intentionally) with the highest input levels and there is a boost mode for even greater distortion. Noise - an analogue noise source with selectable white/pink response has its own control for input level into the mixer. External input / feedback - external audio can be routed into the mixer with its own level control. However, when nothing is plugged into the external audio input socket an audio feedback loop from after the final VCA is fed into the mixer instead. Motas-6 has very powerful filtering capabilities. The 3 independent analogue filters can be chained and outputs mixed to the output VCA for powerful dynamic sound shaping. For example, combining one of the low-pass filters in series with the high-pass filter allows a band-pass response output where the response low and high points can be individually modulated to sweep in (potentially) complex and interesting ways! Low-pass filter 1 (LPF-1) is a 6-pole voltage-controlled low-pass filter (VCF) with adjustable resonance to self-oscillation (with independent 1, 2, 3, 4, 5 and 6-pole outputs). The input to LPF-1 can be set to: mixer (default), LPF-2, HPF, noise source, pulse wave of Oscillator 1, sawtooth of Oscillator 2, triangle wave of Oscillator 3 or the sub-square from Oscillator 2. Uniquely, the resonance feedback signal can be taken from 3 different locations in the audio path for 3 different sound characteristics. Low-pass filter 2 (LPF-2) is a 4-pole low-pass voltage-controlled filter with adjustable resonance to self-oscillation. LPF-2 has a different circuit design and therefore sound character compared to LPF-1. The input to LPF-2 can be set to: mixer (default), LPF-1 (pole-1, pole-2, pole-4, pole-5 or pole-6), noise source or HPF. High-pass filter (HPF) is a 2-pole high-pass voltage-controlled filter. The input to HPF can be set to: mixer (default), LPF-1 (pole-1, pole-2, pole-4, pole-5 or pole-6), noise source or LPF-2. The output voltage-controlled amplifier (VCA) stage has a choice of analogue clipping/distortion options: dry, soft clip, hard clip, soft clip + hard clip, dry + soft clip + hard clip. 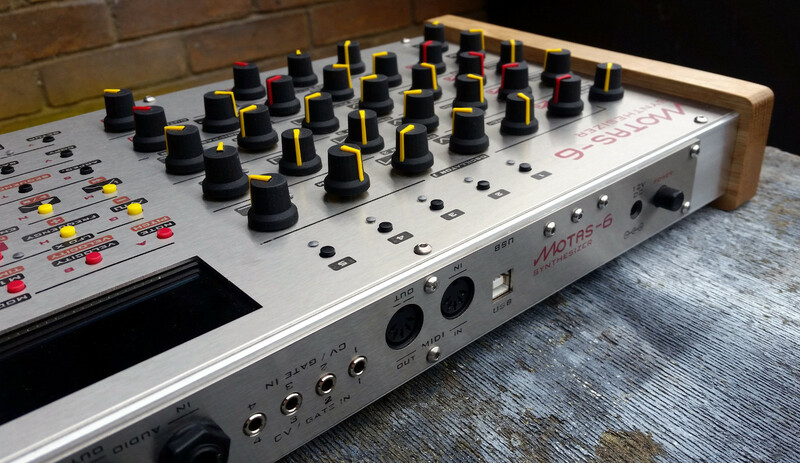 Motas-6 has a super-flexible modulation architecture: each and every parameter rotary knob has independent modulation from EG, 2 x LFOs (one global and one dedicated to that parameter), key, velocity and 4 x global modulators. 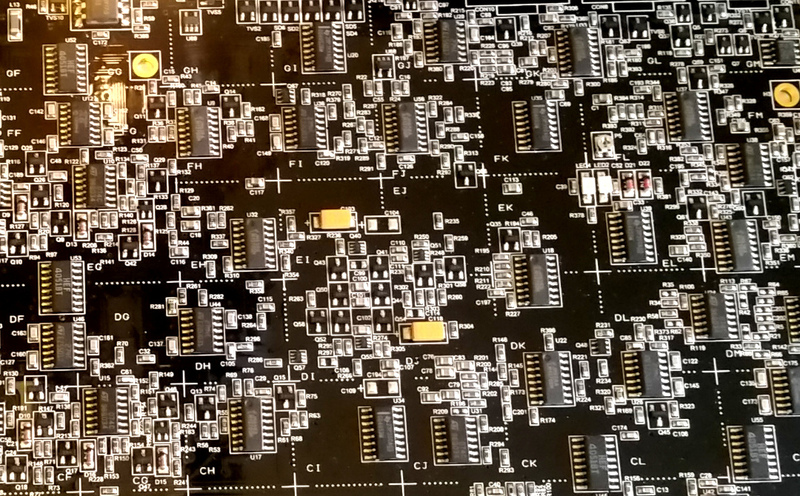 There are 4 global EGs (Envelope Generators), 4 global LFOs (Low Frequency Oscillators), 33 parameter-local EGs, 33 parameter-local LFOs and four freely configurable modulation sources from MIDI and CV/gate inputs. 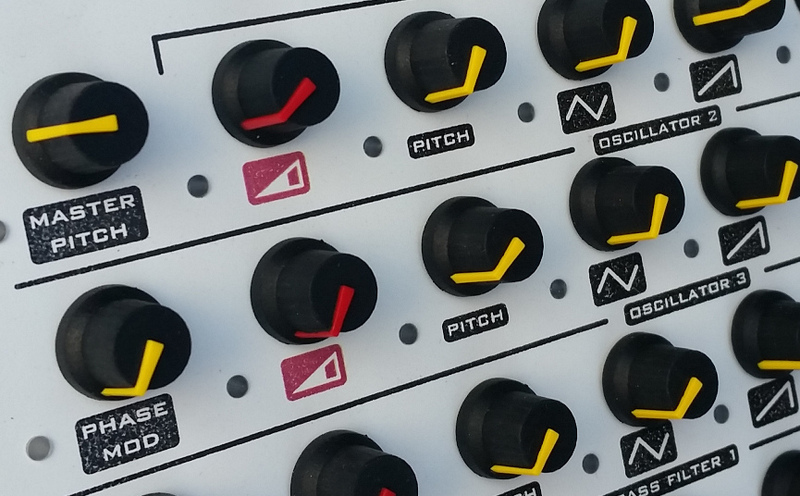 Every rotary knob parameter has individual modulation amount settings from each of these 4 modulations sources. The source can be assigned from almost any MIDI CC controller plus MIDI pitchbend, MIDI aftertouch or analogue CV signals. The assignment is done in the setup menu and is saved with each patch. In this way an external controller can influence the sound across multiple parameters. 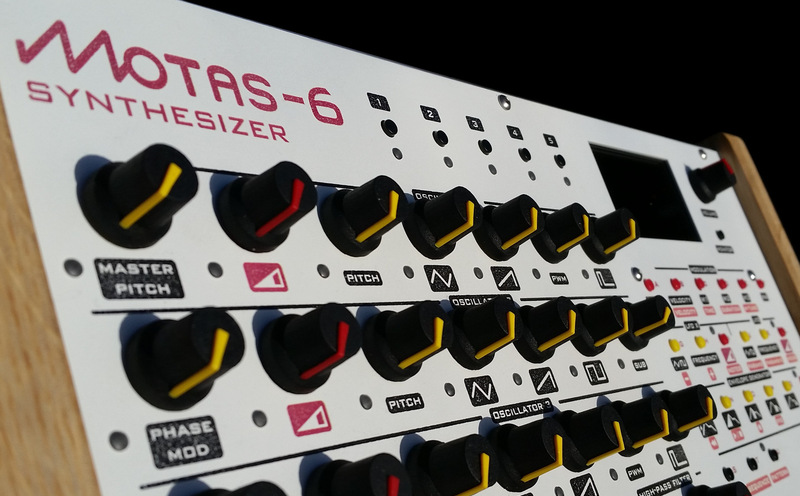 Motas-6 has 33 independent high-resolution LFOs as well as 4 global LFOs. Each LFO has 50 waveforms to choose from including sine, square, ramp through to noise, pulses, bursts, complex shapes and pitched/sequence-style shapes. The frequency can be set from a very slow 0.001Hz to audio-rate 450Hz (period 1000s to 2.2ms). Each has its own trigger/re-trigger sync options and single-shot options. The global LFOs can sync to internal, MIDI or CV/gate clock. Motas-6 has 33 independent high-resolution EGs as well as 4 global EGs. Each EG has Delay, Attack, Decay, Sustain and Release (DASDR) settings with ADR from a very fast 1ms to a sedate 34.6s. 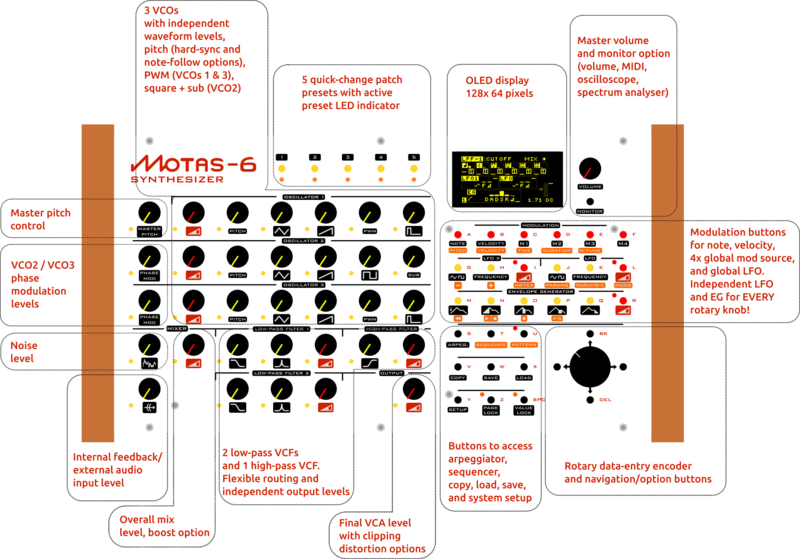 Motas-6 is a very powerful synth and has a lot of flexibility in controlling the sound, much like using a bank of modular components. However, unlike modular systems the entire patch setup can be saved to over 500 memory locations (10 banks of 50). Motas-6 comes with 3 banks (150 presets) already programmed to get you started. There are 5 instant-access patches available at any time (in RAM memory). In vector morphing mode dual external controllers allow the active patch to morph in 2-dimensions between the first 4 presets. On exit from this mode the resulting patch settings are stored to the 5th preset automatically. 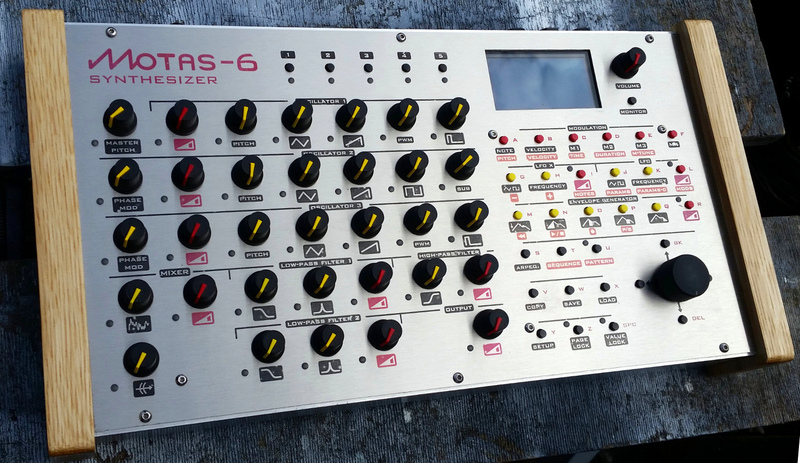 Motas-6 has a built-in pattern sequencer. 1-bar patterns of notes and parameter change data can be stored and chained to together into a 2 track sequence. In the sequence each pattern can be transposed, repeated and delayed. 15 patterns are active at any one time (56 patterns can be saved to non-volatile memory arranged in 7 banks of 8 patterns). 16 sequences can be saved (2 banks of 8 sequences). Not only does the saved sequence contain all 15 RAM patterns, also the 5 complete RAM patches are also saved ensuring that every detail of the sequence is captured. Live changes to any of the sound parameters can be recorded in real-time and are saved with the pattern. The parameter changes are displayed in the pattern edit pages and can be edited after recording. 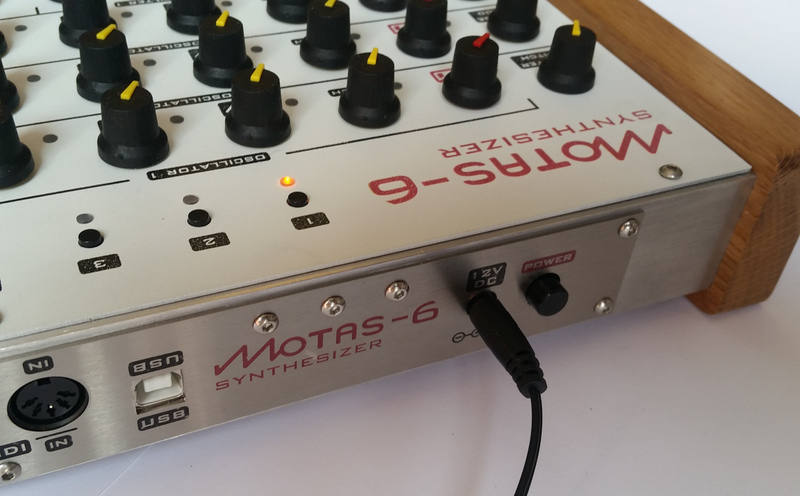 Motas-6 has a built-in arpeggiator that can be synced to internal or external clock (MIDI or CV/gate). Options including hold-modes, direction, note-range, swing, pattern, note-length and delay. The settings are stored with the patch. Motas-6 has a USB MIDI connection (standard type-B connector) and can transmit and receive all parameter data changes in real-time using NRPN MIDI codes at 12 bit resolution (unlike many other products that are limited to only 7-bit) for high-resolution real-time recording and control of the sound. Free software is provided as standalone or VST/AU plugin (to use in your favourite DAW) for Windows, Mac and Linux. Motas-6 has 4 CV/gate inputs. These are digitally sampled at 2.5kHz and then each can be used to trigger note on, control pitch (all, or individual oscillators) or as a modulation source by assigning to the M1-M4 global modulators (the setup is completely flexible with gain/offset control and mode for each input) to allow your external analogue sequencer or other hardware to fully control Motas-6. There are several signal monitoring options which can be fun and educational! Level monitor - shows the audio signal level on the main out. Useful for monitoring signal levels. Also there is a dynamic limiting feature that can be enabled here. MIDI monitor - shows incoming MIDI data on the MIDI IN port and USB MIDI port. Oscilloscope - shows a real-time waveform of the output audio. The time and amplitude axes can be zoomed, auto-scaled and paused. Spectrum analyser - shows a real-time spectrum (signal amplitude versus frequency) of the output audio. The frequency and amplitude axes can be zoomed, auto-scaled and paused. In the setup menu are a series of pages to setup various Motas-6 settings which are stored in non-volatile memory. Settings and options include patch portamento (rate/speed), pitchwheel sensitivity, internal/external clock and tempo, MIDI channel, assignment of M1-M4 modulation sources, morphing modulators, CV/gate settings, global tuning, options for send/receive MIDI data, display contrast, automatic calibration of analogue circuitry and more. Motas-6 can be easily firmware-updated to enable new features in the future, using the provided free software. Download the user guide to read the operation and features of Motas-6 in full detail. The user guide also features many hints and tips for patch creation.